School’s out, and as my summer offer begins – details below – my own summer reading is well underway. So far this year, my holiday reads are not so much the result of conscious choice as chance – books that turned up serendipitously in my life, embedded in their own little stories. 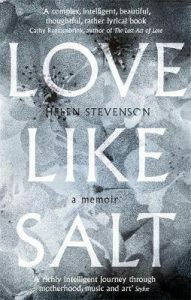 The first, Love Like Salt, turned up at a party, appearing out of the bag of its author, Helen Stevenson. We were at a writers’ party to which we’d been asked to bring copies of our books; after talking for a while about life and writing, we spontaneously swopped our own pieces of life-writing. Helen’s exquisitely written memoir centres on her experience as a mother of a daughter with cystic fibrosis and her decision to end what was, on the face of it, an idyllic life in France. But, like the best of its genre, Love Like Salt is really about love and the unexpected challenges life throws at us. My second serendipitous read came via a back-handed recommendation from my godmother. 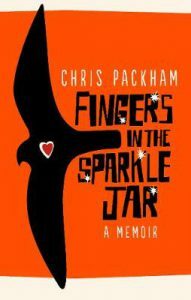 She couldn’t say she enjoyed Chris Packham’s memoir about growing up with Aspergers, she said, but she found Fingers in the Sparkle Jar ‘an unusual book’ which made for painful reading at points. That got me interested, and so, despite the many other titles on my to-read shelf, I bought a copy. But in the event, I aborted my reading on the second chapter, and herein lies a different tale about reading and writing. 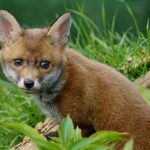 As a well-known zoologist, Packham has naturally not devoted much time to learning the craft of writing, while to this particular reader, style matters. It’s not that his book is badly written; it’s more that its voice is part celeb-memoir, part jolly-bloke, descriptive speaking style he tends to use on Springwatch – difficult to take in large quantities. Meanwhile, my own writing and reading background has heightened my awareness that, in fiction and non-fiction alike, the voice of the narrator is as least as important as the story itself. I’ll certainly go back to Packham’s memoir; sometimes all it takes to appreciate a book is a shift in mode and expectation. And of course the subject – the relation between humans and animals – is bang on-topic for my latest writing project. But, lying in a field earlier this month, I chose to move straight onto the other book in my suitcase, a short work of fiction given to me by a friend last Christmas. With a writer for narrator, The Guest Cat is very much a writer’s book. The story itself is slight – a cat starts visiting a couple; they get fond of it, and then [SPOILER ALERT]. But the voice of the storyteller has a still, matter-of-fact quality that takes you right into his distinctively Japanese world, something which the translation only seems to heighten. 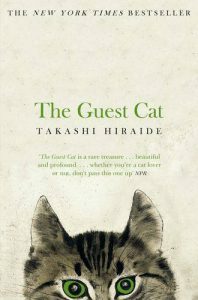 The novel explores an existential puzzle – why do the couple love this particular cat so much? – without ever reducing it to a simple answer. If you’re noticing that common themes seem to be emerging out of my serendipitous summer reads – love, especially that between humans and animals, and the way life works on us, for better or worse – you’d be right. And perhaps that’s not a matter of chance. Sign up to my email list and receive a free copy of one of the ebooks in The Secret Life of God series. Put your email address in the box to the right, and then claim your copy by sending an email to: alexklaushofer AT gmail.com with either DRUIDS, SUFIS, MONASTICS OR HERMITS and EPUB, MOBI or PDF in the subject-line. Offer ends 19th August. ⟵A Buddhist monastery? Oh, the secret life of Bradford-on-Avon!